A retreat by tech stocks and dips among the local banks dampened prices here yesterday. 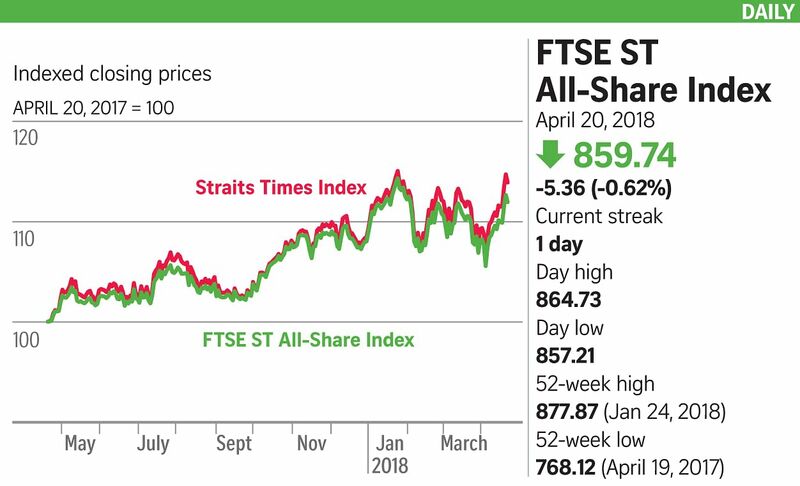 The key Straits Times Index (STI) fell 25.35 points, or 0.7 per cent, to 3,573.38 on trade of 1.5 billion shares worth $1.4 billion, with losers outpacing gainers 271 to 144. Semiconductor-related stocks fell most sharply after Taiwan Semiconductor Manufacturing - an Apple supplier and the largest contract chipmaker in the world - forecast weak smartphone demand in the second quarter. The news caused its stock to slump 6.3 per cent yesterday. Around the region, stock markets in Japan, Hong Kong, China, Taiwan, South Korea, Australia, India and Malaysia were a similar sea of red. In Singapore, contract manufacturer Venture Corporation fell by a whopping $3.53, or 12.2 per cent, to $25.29, while semiconductor equipment maker AEM Holdings lost 26 cents, or 3.7 per cent, to $6.73. Hi-P International, a components supplier for Apple and Amazon, fell 10 cents, or 4.7 per cent, to $2.02, and precision manufacturer UMS Holdings slid five cents, or 4.2 per cent, to $1.13. Bank counters dipped as credit ratings agency Fitch Ratings warned that lenders in the Asia-Pacific will face heightened property risks over the medium term. It cited their relatively high exposure to the sector and how susceptible heavily indebted households were to a rise in interest rates or unemployment. In Singapore's case, while Fitch acknowledged the robust property market and strong banking regulations, it said continued rapid lending and a further rise in risk appetite could increase the prospects of negative ratings action in the medium term. DBS fell 32 cents to $29.59, United Overseas Bank was down nine cents to $29.69, while OCBC Bank dipped one cent to $13.73. Two STI components that bucked the falling trend were Sembcorp Industries and Keppel Corporation. Both companies held their annual general meetings yesterday. Sembcorp added eight cents to $3.24, while Keppel rose 14 cents to $8.21. Sembcorp said at its meeting that it will support its oil and offshore marine unit through the industry cycle following its business review. It added that its 61-per-cent owned Sembcorp Marine was "well positioned" to benefit from the industry recovery. Taken as a whole, the index still added 72 points, or 2.1 per cent, over the week, with three sessions of gains and two sessions of losses over the five days of trading.